It’s been one of those weeks for us. I have been tackling this blog to install the new blog design. At the beginning of the week I was not successful with what I wanted to achieve. But I’m half way done now. It’s all looking prettier and working better than before. What do you think about the graphic design? I so love it. It’s the work of my friend Anke from Ankepanke. Appliances decided to go on strike in our house. Three days ago our dishwasher died and yesterday morning we woke up to no hot water and a cold house. Yes mister trusted old boiler bit the dust too. Not a good thing now that we are preparing to have family over for RJ’s birthday this Sunday. No that’s not all though our iron also decided to join in the fun and start leaking and not heating up. Luckily we could get a new boiler in the same day. By 21:30 they got the boiler installed thank goodness. I do understand that all these are minor glitches in the grand scheme of things and are just a major pain in the rear. First world problems if you wish. All this stuff made me think more about the things that I was happy about these past few weeks. Apart from the loving family I have I also encountered some lovely people on social media. Yes I know it’s not all bad and ugly out there. I make it a point to stay away from negative people on social media and I myself want to focus on the positive while still keeping it real. Last week I saw a beautiful picture (image above) in the gallery of Fanne whom I follow on Instagram. 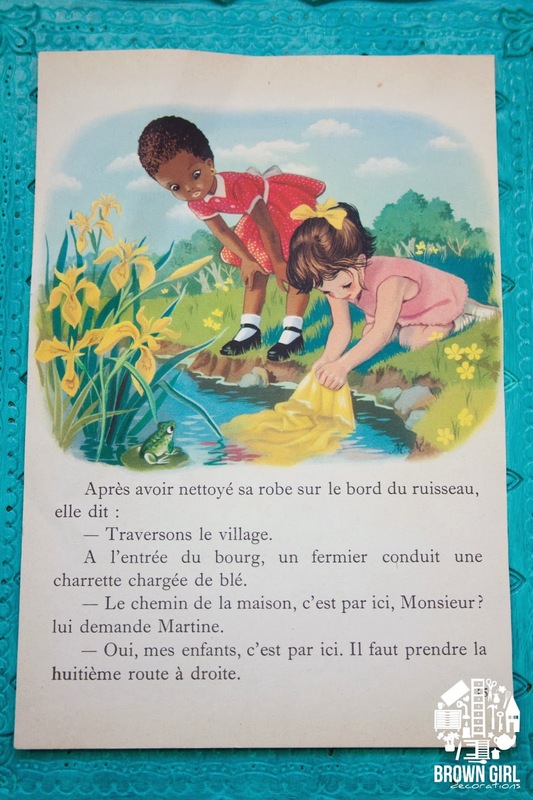 It was a page out of a vintage French children’s book with a very cute little brown girl in it. I was immediately smitten with it. It’s not often you come across vintage artwork that depict black people in such a lovely way. I left a comment and hinted (very clearly ;)) that I would love to have it. Guess what Fanne send it to me. How sweet is that. Thank you Fanne! I will give it a special place in my work space. Working on the new design for the blog made me think back to when I started out about 2 years ago. The very first two people who started following me are still following me now. No non of them family. I want to say thank you for being here Mireille B and Hermina d V.
I'm still in love with these pictures too.